A month of Malbec? Really? My wife made the decision; it is her fault that I must drink mostly Malbec for a month. I visit Europe all the time as the essential perk of writing about wine. She only gets one vacation per year. So while we both kick out options for our annual vacation together, she gets to decide. Antarctica has been on our list for years. We want to see the last unspoiled place on Earth: a vista of nothing but white, blue and black. This year, we are feeling more mortal. Visiting Antarctica has the feel of "we've done that, now I can be hit by a bus." To get to Antarctica, we would go through Argentina, and would spend an extra week there. Going to Argentina means drinking Malbec. I don't hate Malbec. I don't hate it the way I hate an ear infection or the New York Yankees. I just never order it. There are vegetables I dislike -- Brussels sprouts, cauliflower -- that I order several times a year because the preparation sounds interesting. There are foods I dislike intensely -- blood sausage -- that I try because somebody at the table tells me I might like this blood sausage. I've trained myself to like previously abhorrent foods like natto, though I'm still not there on squid guts. But Malbec, I cannot remember the last time I ordered it. I don't mean months or even years. It is possible that I have never in my life ordered Malbec. I have tasted it, many times. I have reviewed it. I have even drunk it, when somebody else ordered it. There are wines I actively dislike: Pinotage. Buttery Chardonnay. Malbec just bores me. I believe any producer that can make a good Malbec can make something else better. But we're going to Malbec country, so I will drink Malbec. I did a column for Palate Press with my bullet-point observations of Argentina's wine scene as a tourist, which are a helluva lot different -- and more "normal" -- than what you see on a press trip. This is my daily wine diary from the trip. We ate at four of the alleged top 50 restaurants in Latin America. There will be steaks, penguins, and a confrontation at The Wine Shop at the End of the World. And there are pretty pictures, though by popular demand I left out the ones of me in a hot tub. I actually wrote about 8000 words and this will be about 2/3 of that, so yes, it's edited, but it's a long diary. But what are blogs for? We have an excellent meal at one of my favorite airport restaurants, Pappadeaux in DFW. They have one Texas wine on the list, a Trebbiano by a producer, Duchman, I've never heard of. The server brings me a taste, it's not offensive, so I say "When in Texas ..." and order an 8-ounce glass. Trebbiano is a white version of Malbec: something so inoffensive but also so characterless that I would never order it, given alternatives, and Pappadeaux has a good by-the-glass list. But this is psychological preparation. I finish 8 ounces of Texas Trebbiano with a dozen oysters and crawfish étoufee and I need another glass, so I get 5 ounces of Hirsch Gruner Veltliner from Austria. Oh My God is that delicious, so much better than the Trebbiano. This is not a good sign. 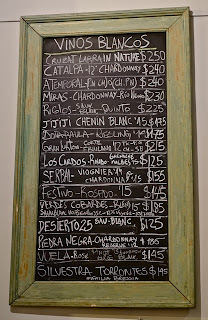 For our first dinner in Buenos Aires we go to Las Pizarras, where the entire menu is on chalkboards that change daily. I consult with the owner about the wine. He asks where I'm from. "San Francisco," I say, "But I like more old-world style wines." "Classic," he says. I nod. "We have classic wines. That Malbec, very classic, it got 94 points from Robert Parker. Very strong, lots of oak. That one is also classic, very good oak flavor." He runs down a few more classics and I'm in the disagreeable situation of realizing 1) I'm going to have to order anything other than his recommendations, and I'll have to do it politely and 2) As he is the wine buyer, there may not be anything on his 40-bottle list that I want to drink. We order smoked langoustines, a Spanish-style omelet with squid and potatoes, and wild boar with black bean sauce, so I switch his attention to white wine. "Do you like Chardonnay? Because we have a good one, very oaky," he says. I tell him I drink a lot of Chardonnay and ask about the Torrontés. He looks disdainful; it's one of the cheapest bottles, but how to tell him I just don't want oak? I say it just like that. Turns out he has an unfiltered Chenin Blanc, 10.5% alcohol, from a producer called Ji Ji Ji. Done. It's terrific, slightly cloudy, good texture, fruit-driven but with good complexity. At the restaurant's exchange rate it's just under $15. So we have a great start to the Argentina experience, but we're just putting off the Malbec, like when your dentist tells you that you don't have to get the filling done on this visit. We dive into classic Argentine dining at Don Julio, a parillada universally recommended for its steak, wine list and service. At 8 p.m., when we arrive -- the Early Bird Special for Argentines, who like to dine at 10 p.m. or later -- the restaurant is nearly full, and it fills completely before the waiter brings our menus. I discuss steak choices with the sommelier and take her recommendation for what they call the "prime rib." I like meat on the bone, and in Argentina "prime rib" means just that, an enormous rib bone with a 3-inch thick steak attached. Don Julio has two pages of Malbecs and markups are light but I am stunned to see so many over $100 US; several are over $400 US. I confess to the sommelier that I don't usually drink Malbec and she recommends that I get something else because "Malbec is overpriced now for what you get. Everybody comes here (Buenos Aires) wanting Malbec so they can charge much more for it." Unlike the day before, she understands what I want in a wine and we narrow my choices to a Syrah, a Cab and a Bordeaux blend, and I ask for the one with the lowest alcohol percentage. 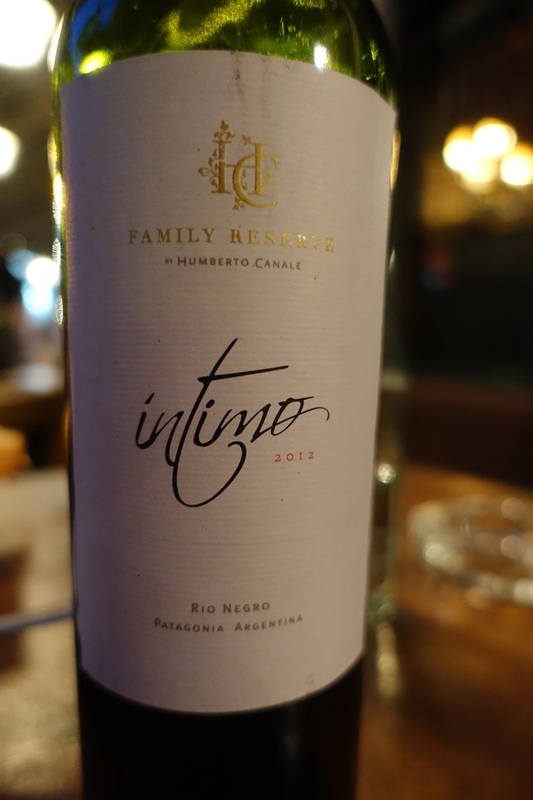 Thus I have my first mostly Malbec wine, Humberto Canale "Intimo" Family Reserve 2012, 13.8% alcohol, from Patagonia. It's 60% Malbec with 20% each Cabernet Sauvignon and Cabernet Franc. The nose is alluring, and it's balanced and graceful, with fine fruit and savory notes. I think the backbone comes from the Cab Sauv and the aromatic interest from the Cab Franc and from the Malbec comes ... well, I don't know, but we drink the whole bottle with gusto, and at $22 feel happy with it. The steak defeats me, though; I leave enough on the plate that she asks if I want it rewarmed. My belly full of beef, I toss and turn all night and have a fitful dream in which my long-ago roommate Jeff drives my wife and I to a kids' summer camp, where he promptly gets a long nail in his hand that we have to extract. I pull my wife aside and ask if she knows why he brought us here. "It's a dream," she says. "My dream?" I ask in my dream, perhaps stupidly. I blame the Malbec. That's 10 dishes, not one big salad, for $100 US, with six glasses of wine for another $50. I end up getting quite a bit more wine for that price. I didn't know there's Riesling in Mendoza. Luigi Bosca does a fine dry one that's excellent with two of my favorite dishes, grilled Romaine lettuce with a smoked egg yolk -- why don't Americans grill lettuce? -- and steamed oysters coated in nori and seawater foam, with a dashi-based soup that tastes like clear chawan mushi. My first Torrontés of the trip, Colome 2015 from Salta, is floral and refreshing and better than the underspiced rabbit or metallic sweetbreads. 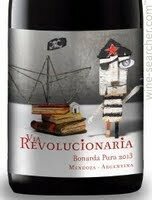 My favorite wine of the night is Revolucionaria Bonarda Pura 2015; made by carbonic maceration, it's like a cru Beaujolais, with an earthy, floral nose and light but textured mouthfeel. About Bonarda: it's the second-most planted grape in Argentina, but you rarely see it in the U.S. The best have blueberry character and soft tannins, and I expect to drink a lot of Bonarda. It turns out that Bonarda is not respected by the trade. Most shops carry only a few bottles, whereas they have stacks of Malbec. So to get a Bonarda here, in the Best Restaurant in Argentina, cheers me because it seems like a validation for the grape. The wines are coming along great, and I love the sous vide duck with cheese foam and cherries, followed by crusty roast lamb with a crunchy, creamy stick of polenta beside it. I'm burying the bad news. The first Malbec is the only wine I can't drink: Bodega Tacuil RD Malbec-Cabernet. Over 15% alcohol, it pulls off the rare feat of being in-your-face powerful while also too herbaceous. The sommelier notices my glass stays full, so he subs in a much better Gran Lurton Cabernet Sauvignon 2001 that has the elegance of maturity. Then he brings over a Tempus Alba Pleno 2010, a Malbec-Cab blend with some restraint. Success! A Malbec-based wine I enjoy. The dish of the night is a large thin tile of dark chocolate over small dabs of chocolate mousse, cream cheese ice cream, and coffee-flavored dulce de leche. A fine Salentein late harvest Sauvignon Blanc seems like a great way to end the meal. But the sommelier wants me to try some grappa, and pours D.V. Catena Grappa from Malbec. It's outstanding, perhaps the best iteration of Malbec I've had: aromatic, flavorful, and above all smooth. Is this Malbec's highest and best use? We did not bring any alcohol to Argentina, even though we'll be getting on a boat to Antarctica for 10 days and will probably face corporate wine at cruise ship prices. I thought I might give my liver 10 days off, but as embarkation looms, I chicken out and begin looking in wine shops. Nothing appeals to me in Buenos Aires. I can't find a wine shop that sells wines like the unfiltered Chenin Blanc or carbonic-maceration Bonarda. The problem with disliking Malbec in Malbec country is that it ruins any relationship between price and anticipation. I would happily spend $40 or $50 for a special bottle of wine to toast penguins with, but for that money, all I see is Malbec at 15% alcohol, some of it moved from one new French oak barrel to another while Michel Rolland chuckles via Skype. Should I get an expensive Pinot Noir in a country that thinks these kinds of Malbec are the apex of wine? Or an expensive anything? Spending more, I believe, will make me less happy. I can't find a single bottle of wine I want to buy in three Buenos Aires wine shops or at the domestic airport. We get to the last wine shop in the world, in Ushuaia; the only wine shop south of here will be the PXs at the military bases, where we don't expect to visit. It's my last shot. It's a national holiday, so maybe the regular shopkeeper is off duty. I show the staffer a photo of the carbonic-maceration Bonarda and he says, "No, we don't have it." I think this is good; maybe he recognizes it. There are several ways I can describe the type of red wine I want: soulful, elegant, complex, terroir-driven. The one I can most easily say in Spanish is, "I want a wine lower in alcohol." He blusters, throws his hands out wildly, stalks away. "All wines in Argentina are the same. They're all 14 or 15% alcohol. They're all the same." He's angry so I decide that conversation is done and turn around the labels of the Bonardas to check for myself. He storms back. "You see? They're the same," he shouts. My Spanish is good enough to tell him that 13.7% and 15.1% are not the same, but I don't think he'll get the point. We leave the store and my wife says he probably deals all day with Americans getting off cruise ships who ask, "What's the best wine?" Perhaps, but I think he shouldn't be working in a wine store. "If he knew wine, or had good people skills, he wouldn't be working in a wine store in Tierra del Fuego," my wife says. Point. We go to the supermarket and there's a well-priced selection of supermarket wines, and I consider springing for a Torrontés, but I really want a red wine on the boat and none of them appeal to me as much as the 2011 Bonarda (13.7% alcohol) that I was holding back in the unfriendly shop, The Wine Shop at the End of the World. And it was only $8. So we go back for it and don't say a word, just pay the man. It takes more willpower to order a $3 wine in a restaurant than I thought. We go to Chicha's for king crab and the wine list includes only wines we had seen at the supermarket. Supermarket Chardonnay never appeals to me. Sometimes supermarket Sauvignon Blanc does, but I didn't come to Argentina to drink that. I root through the wines in the refrigerator while the elderly man running the restaurant watches patiently. 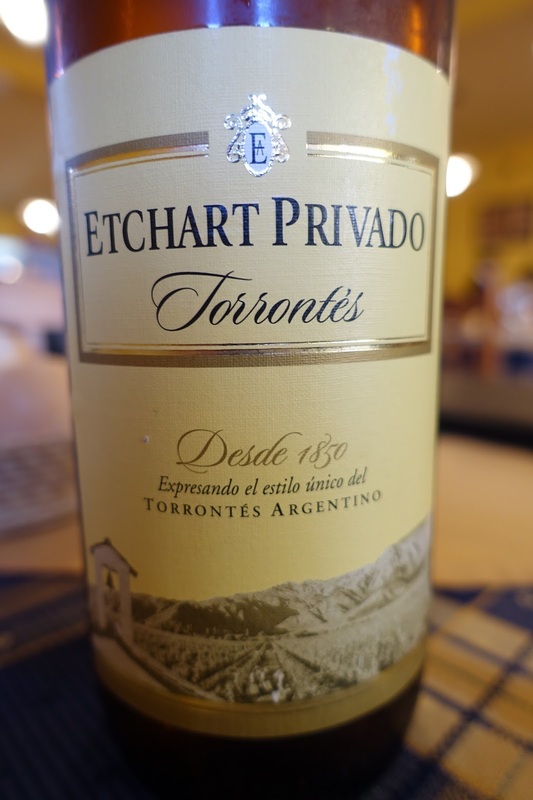 What I want is Etchart Privado Torrontés, 12.7% alcohol. I want to drink this characteristically Argentinian varietal and that's the only Torrontés he has. Problem is, I was at the supermarket and it was only $3, and the low price deterred me from buying it there. It's the cheapest wine on Chicha's list, at $7. Do I dare order a wine so cheap? I'm that daring, and we love it: it's aromatic and refreshing, with a light fruit sweetness that my wife enjoys. It's great with an outstanding octopus and king crab casserole and a grilled hunk of merluza (sea bass). With the exception of omnipresent Malbec -- people drink it with crab -- Argentinians dismiss their national varieties. Most wine lists have no Bonarda. I asked about the one Bonarda at Don Julio and the sommelier told me she wanted to take it off the list. 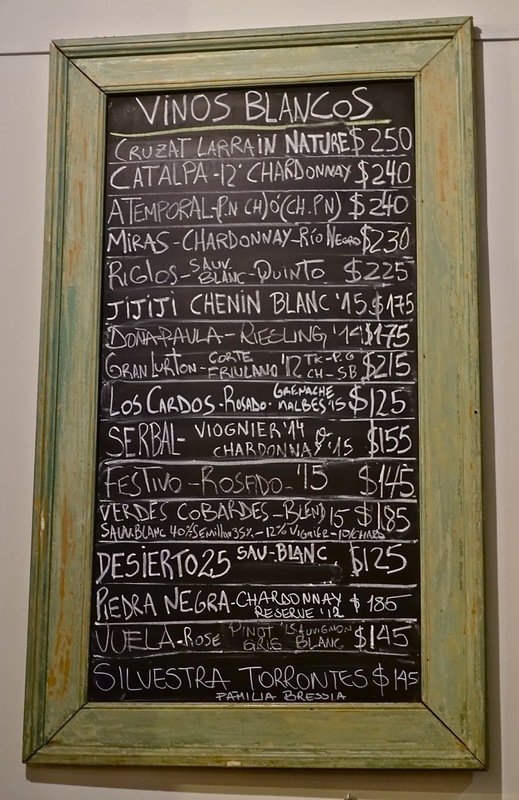 Torrontés usually makes wine lists but Chicha's just calls the Etchart Privado "blanco." Maybe being so cheap is stigma enough. The end of part 1. Part 2 is here with icebergs, more penguins -- and more Malbec. Thanks, Jameson! Seek out the Bonarda, you'll like it. That Chenin Blanc sounds wonderful, I'll have to try and seek some out from Argentina now! And Bonarda is one I haven't heard much at all about. Time to seek some out =D I'm looking forward to reading part 2.
there is good Malbec, I have had it. But its from Cahors, but maybe you don't like that either? Jason: I don't order Cahors. I have judged a couple that I've liked, but I haven't had one I've loved, and there are so many wines in the world. Try the rest of the Colome portfolio. High elevation makes them unique -- they are not what you would expect. And as for Bonarda, word is that grape makes its way into many of the least expensive 'Malbecs" snapped up by consumers who ask for "that new grape from Argentina." During the Argentine Malbec craze a few years ago, there wasn't enough Malbec planted in the country to produce the resulting volume of wine, especially at the $10 retail price point. "About Bonarda: it's the second-most planted grape in Argentina, but you rarely see it in the U.S."
California Charbono (a.k.a. Bonarda) is an endangered species. "Top Cabernet Franc from Argentina and Chile"